Having just spent the past few days on the sea in Halifax, Nova Scotia, I am on a bit of a seafood kick! Yesterday was mussels and today is lobster. Lobsters have a beautifully creamy and luxurious meat and are obviously so popular when you live on an ocean. You really do see it everywhere, and coming from Ontario, it made me wish that we had such fresh lobster readily available all the time in Toronto! On the menus this week I saw lobster in a variety of forms, not just the traditional whole lobster with butter. One of the best lobster dishes I discovered as it is my sister's favourite is a lobster stuffed ravioli, in a parmesan fonduta with a lobster cream throughout, so decadent and so rich. 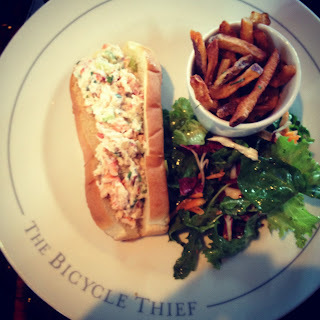 The other favourite dish of the trip which is so popular along the eastern seaboard was the famous lobster roll. I had one for lunch at it was truly spectacular! I have never had a true lobster roll before, so I knew that this trip was the chance to try it. A traditional lobster roll is done on a white hot dog type bun, grilled and sometimes seasoned with a garlic butter. It is stuffed with a soft and rich lobster salad, generally complete with scallions and celery. This roll also had a lemony mayo as the mayo base which I really enjoyed, a nice twist on a classic simple mayo dressing. Lobster out east are known as the "King of Seafood." They are a great source of protein and are found all across the Canadian Atlantic. Lobster are harvested in cold icy salt water, in traps, attached to lines and hauled in by hand. The lobster industry ensures that harvesting and processing methods are conducted in an ecologically responsible manner, which is great for those of us concerned with sustainability! A quite note, for those of you nervous or who feel off put by putting a live lobster into a boiling hot water - do not worry - they do not feel pain as they have a decentralized nervous system!